Are you looking for bsnl company jobs? 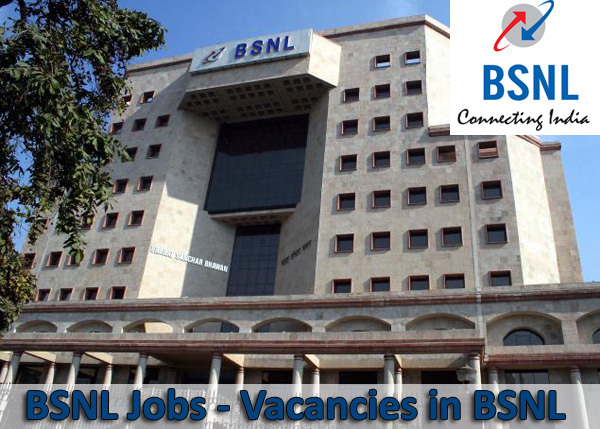 BSNL is hiring for fresher and experienced candidates. Want to apply for it? Now check it below all details. Age Range: The applicant should not be more than 30 years of age and less than 18 years on the closing date for receipt of applications. However, the upper age-limit is relaxable as per standing instructions of Government of India on this subject for SC/ST candidates. i) Candidates must apply in the prescribed form only. The prescribed application form is included in this advertisement. Legible print out of Application (only on one side of paper) on A4 size paper (30 cms x 20 cms) may be taken. ii) Applications received after the stipulated date of submission and/or incomplete applications will be rejected. BSNL is not responsible for postal delay/loss at any stage of communication. iii) If the candidate has registered his name with the Employment Exchange proof of the same must be submitted along with the application form. iv) As limited vacancies are available, eligible candidates will be shortlisted on the basis of merit in the academic examinations (i.e. BE/B.Tech/Diploma). The candidates who have obtained the minimum required Educational Qualifications not more than two years ago from the Last date of this Advertisement will be given preference. v) The provisional selection shall be made from amongst the candidates on the basis of no. of seats, merit, reservation, etc. vi) Candidates already undergone Apprentices training for 1 year or more need not apply. In this regard, candidate will specifically give undertaking under his signature that he has not undergone any apprentice training anywhere previously. of Apprenticeship of the candidate. The “ Application form” complete in all respects should be sent by Registered post or by hand to the DGM (A/HR), O/o the CGM Telecom., BSNL, Assam Telecom Circle, 3rd Floor, BSNL Bhawan, Panbazar, Guwahati-781001 and will be received upto 1700 hours of 31.03.2016. The envelope containing application form should be marked “Application for Graduate/Diploma Apprentices in BSNL. .Applications received after 31.03.2016 will not be entertained or considered and BSNL will not be responsible for postal delay, if any.